This is the boat to own here in WA, the Holy Grail of enclosed Fly Bridges. The Riviera 47 Enclosed Fly Bridge is an extremely sought after boat and generally seen as the G2 model. Did you know there was a VERY limited run of what Riviera know as the G3, the Unicorn of 47 Enclosed Fly Bridges. R Marine Mandurah is very excited to present this beautiful Riviera G3 47 Enclosed Fly Bridge !! Im sure you can understand the rare nature of this hull, the brilliant presentation should see this Riviera 47 EFB sell in the coming weeks if not earlier. Please make the time to contact the R Marine Mandurah team and arrange a time to view this boat. Fitted out to a very high level the boat is ticking boxes from the moment you step onboard starting with the Teak finished hydraulic swim platform, Teak cockpit, S/S BBQ and oversized teak steps to the Fly Bridge ladder. Plenty of storage and the usual Rivtech cool box, sink, underfloor storage and engine bay access. Keeping the sun at bay thanks to a 3/4 rear awning, Euro extension and side breezeways. Take a casual step up from the cockpit through the aft door and the saloon opens up before you. Finished in high gloss Cherry with an Amtico flooring all the way through to the companion way, there is no need to be constantly worrying about wet feet over your carpets as the current owners have installed heavy duty, high quality clear carpets covers throughout the remainder of the boat. A fantastic upgrade for the busy boating family. Vacuum the sand out via the ducted vaccie and mop the floor at the end of day, easy ! The traditional corner leather lounge, deep, wide and very comfortable hides the extra double bed for when the kids bring friends or for that extended fishing trip up North. For the entertainer there is a Cherry finished table to Starboard complete with another beautiful leather lounge and a wet bar with an oversized U-Line ice maker with additional fridge space, teamed up with the Bose lifestyle stereo system, large flat screen TV, Foxtell ready and this boat is still ticking boxes. Every inch of the saloon bounces the light back to you, she is very well maintained ! Additional Amtico flooring through the galley is another fine touch and stands this boat out amongst the pack. Twin galley work stations will allow two people to move through the galley with ease. Recently replaced twin door Vitrifrigo fridges, Vitrifrigo draw fridge, Fisher & Paykal cooktop, Smeg Convection micro with Corian bench tops makes this boat a winner in every way right down to the meile washer / dryer fitted to the companion way cupboard. Accommodation is extensive ! Starboard side mid ship master berth with an island style bed, high cherry timbers and a private ensuite... Of course, moving forward to the bow and your boating friends have a beautifully maintained ensuited queen sized island style berth. Just a few steps back and to Port finds the bunks for the kids or the overflow on a busy weekend, but that not the extent of the sleeping capabilities. The saloon lounge rolls out to a nice sized double and the Amtico table in the fly Bridge surrounded by upgraded Marco Sued finish drops down to a very nice berth thank you very much ! So we can happily sleep 10 pax if needed. How good is that ! The Fly Bridge is a true destination on a boat of this calibre, Air conditioned and finished in Macro Suede seat trims, carpeted floors, cherry timer trims and a full set of white breezeways keeping the harsh WA sun at bay. Relax and enjoy a drink at the wet bar or catch the news on the Fly Bridge TV. A great place to relax on a cooler winters day. Stepping to the helm is what this boat is all about ! Relaxing in the Pompanette helm seating pointing the nose towards the horizon, plotting a course to Jurien Bay and away you go... Raymarine electronics, FLIR night vision camera, vessel View smart craft engine management, bow and stern thrusters, QL trim tabs, radio's, stereo, fire control, air con control and digital engine controls. You have full control of this amazing boat, this has just about ticked all the boxes. The envy of the Riviera owners the world over resides in the engine room of this Riviera 47 EFB G3, powered by a pair of the most sort after engines, the Cummins Diesel QSM-11, turbo charged, after cooled shaft driven engines offering 670 Hp. She glides over the harshest of conditions. Showing just over 1200 hours of regular use this installation has years of life left in her to run the length of the WA coast with ease and economy. Are you looking to upgrade, have you been considering a Riviera 47 Enclosed Fly Bridge, have you been waiting for one to show in the WA market ? This is your opportunity to purchase a late model Riviera that seems to ready to step aboard and go. Sign the transfer papers and away you go ! Boatman maintained with regular washes, teak cleaning and more, any issue promptly taken care of without hesitation. Recently polished and hull cleaned below water line. This is a boat to buy with upmost confidence. 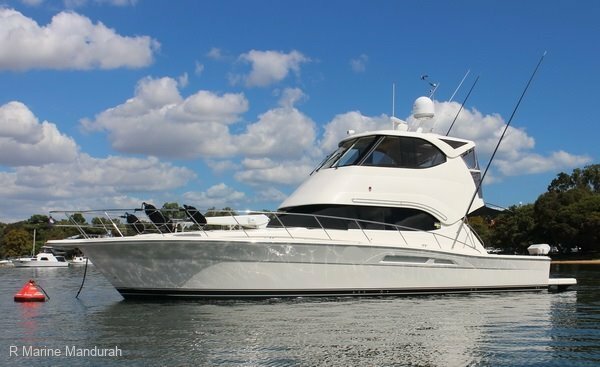 Call the Team TODAY to arrange a suitable time to view what many people consider the perfect boat for WA. Cummins QSM-11 Inline 6 cyl diesel Turbo charged / after cooled Digital throttle Shaft DTS controls Electronic ignitions to helm Vessel View Smart Craft engine management gauges Twin disc gear boxes oil X-Change system to engine room The right engine for the job ! The last Riviera 47 Enclosed Fly Bridge sold fast, we expect this one will to ! Time to make the call to the R Marine Mandurah team today. We can have this boat delivered anywhere in Australia at reasonable cost.